Before the title screen, the film opened with resolute newly-appointed Minister of Magic Rufus Scrimgeour (Bill Nighy) delivering an address regarding Lord Voldemort's (Ralph Fiennes) return to power, in the summer of 1997. He described it as "dark times" with threats, although vowed to the citizenry to defend their liberty and repel the forces. There were ominous headlines in The Daily Prophet newspaper: DARK MARK SPARKS PANIC, VIOLENCE SPREADS - MUGGLE FAMILY MURDERED, DEATH EATER NUMBERS GROW. A meeting of Death Eaters in Malfoy Manor conducted by Voldemort was attended by late-arriving Professor Severus Snape (Alan Rickman) who informed them about Harry Potter's departure from the Dudley home at 4 Privet Drive on the coming Saturday, on his way to a safe house (the Burrow). Voldemort told bloodlusting Bellatrix Lestrange (Helena Bonham Carter): "I must be the one to kill Harry Potter," but that he needed a new wand to do the deed. 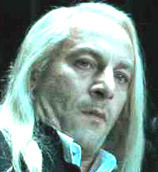 With reluctant Lucius Malfoy's (Jason Isaacs) borrowed wand, Voldemort demonstrated its power (with an Avada Kedavra curse) and killed bound and upside-down levitating Hogwarts Professor Charity Burbage (Carolyn Pickles) of Muggle Studies, before feeding her corpse as dinner to Voldemort's snake Nagini. Members of the Order of the Phoenix arrived to fly Harry Potter away from the Dursley household in pairs on brooms and thestrals, since the technique of Apparating or using the Floo Network would be detected by the Ministry. The Order members included Alastor 'Mad-Eye' Moody (Brendan Gleeson), twins Fred and George Weasley (James and Oliver Phelps), Bill Weasley (Domhnall Gleeson), Arthur Weasley (Mark Williams), Remus Lupin (David Thewlis) and wife Nymphadora Tonks (Natalia Tena), Kingsley Shacklebolt (George Harris), Ron and Hermione, Fleur Delacour (Clemence Poesy), Mundungus Fletcher (Andy Linden), and Rubeus Hagrid (Robbie Coltrane). To fool the Death Eaters, six volunteered to take Polyjuice Potion to disguise themselves as identical Harry Potter doppelgangers. Before boarding Hagrid's two-seater motorbike (belonging to Sirius Black), Harry released owl Hedwig to fly ahead to meet them at the Burrow. The pairs (one 'Harry Potter' and one protector) were "right from the start" ambushed by Death Eaters, and during the fierce skirmish (including a harrowing ride the wrong way on a crowded highway), Hedwig defended Harry, but was hit with a Killing Curse. Harry's wand cast a powerful spell toward Voldemort who participated in the pursuit, destroying the Lord's borrowed wand, and allowing Harry to escape to the safety of the Burrow (with a surrounding 'protective enchantment'). Remus Lupin feared a betrayal, although Harry thought it was Hedwig trying to protect him. George Weasley was the only one severely injured (a bloody ear) during the chase. 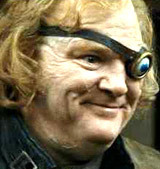 Mundungus Fletcher disapparated in fear after seeing Voldemort, and 'Mad-Eye' Moody was killed. Guilt-ridden about people dying for him, and having nightmares of Voldemort causing more harm, Harry wished to flee, but Ron convinced him to delay his departure until after Bill Weasley's and Fleur's wedding party (to be held under a large white outdoor tent). The Daily Prophet told of a popular book by Rita Skeeter, The Life and Lies of Albus Dumbledore, revealing Dumbledore's Dark Secrets (betrayed in part by "magical historian" Bathilda Bagshot, who had studied Dumbledore's history and first met him at his family's home in Godric's Hollow). During the wedding celebration in the tent, Harry spoke briefly to elderly wizard Elphias Doge (David Ryall), who had written an obituary column in The Daily Prophet about his longtime friend Dumbledore. Ron's rude and gossipy Aunt Muriel Weasley (Matyelok Gibbs) interrupted and disparaged Harry about his friendship and knowledge of Dumbledore (she spoke only from what she had gleaned from Rita Skeeter's book), belittling him: "Honestly, my boy, are you sure you knew him at all?" Suddenly, the patronus (a shimmering comet of light) of Order of Phoenix member Shacklebolt reported to the guests: "The Ministry has fallen. The Minister of Magic is dead. (whispering) They are coming. They are coming." Immediately afterwards, the Death Eaters attacked. Harry apparated with Hermione and Ron, and they magically transported themselves by Apparition to downtown Muggle (non-magical) London. 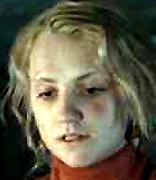 After the trio changed their clothes, they were attacked in a coffee-shop by two Death Eaters (as city-workers), Antonin Dolohov and Thorfinn Rowle, when Harry used a Stupefy command and Hermione a Petrificus Totalus order to defend them, after which Hermione wiped their memories clean with the Obliviate spell. At the ancestral home of the Black family (headquarters of the Order of the Phoenix), located at 12 Grimmauld Place (and invisible to neighbors), the three learned the identity of R.A.B. 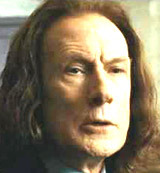 (from the previous film's cliff-hanger) - Regulus Arcturus Black, Sirius Black's brother, who had stolen the Salazar Slytherin locket (an "evil object," one of Voldemort's horcruxes). 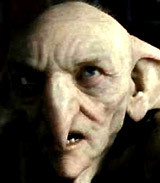 Resident house-elf Kreacher (voice of Simon McBurney) told them that he had vainly tried to destroy the real locket, but then it was stolen by petty thief Mundungus Fletcher. Harry instructed: "Find him." Death Eaters were everywhere, searching for Harry on the Hogwarts Express train. 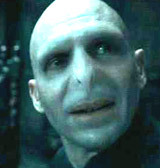 Harry Potter was declared: "UNDESIRABLE NO. 1" - printed on posters. The new Minister of Magic, Pius Thicknesse (Guy Henry) (a Death Eater accomplice), announced that each employee must submit to blood tests for purity evaluation - a means to persecute Muggle-born witches and wizards. Kreacher and freed house-elf Dobby (voice of Toby Jones) returned to the Black home with thief Mundungus, found in Diagon Alley. He admitted that he had given the locket as a bribe to Dolores Umbridge (Imelda Staunton) when threatened with pawning wares there without a license. 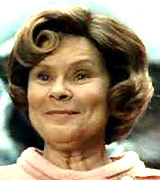 Umbridge had recently been appointed to head the Muggle-born Registration Commission in the Department of Ministry, serving as Senior Under-Secretary under Pius Thicknesse. To gain access to the Ministry of Magic building (with homage to Brazil), to acquire the locket-horcrux being worn by Umbridge, the trio took Polyjuice Potion to impersonate three Ministry officials. The three were separated once they gained entrance (the two guys flushed themselves in through public toilets). Sneaking into Umbridge's office (dead 'Mad-Eye' Moody's eye was affixed to her door) after creating a distraction, Harry saw files of surveillance conducted on his friends (some of whom were deceased, with X's over their pictures). The trio reunited to confront chief interrogator Umbridge in a courtroom where Muggles on trial were being intimidated by Dementors to submit. Harry and Hermione successfully acquired the locket from Umbridge with a Stupefy spell. The three fled from the building (as Harry warded the Dementors off with an Expecto Patronum command), while they changed back into their own personas and were pursued by Yaxley (Peter Mullan) - the Head of the Department of Magical Enforcement (and also a Death-Eater) and other guards. As they disapparated from the Ministry and ended up in a wooded forest, rather than returning to Grimmauld Place - it was too dangerous there, since Yaxley had ahold of Hermione as they fled and saw their hideout. 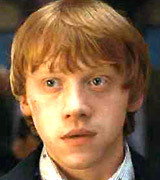 Ron suffered a severe upper left-arm wound when splinched (part of him was left behind during their hasty retreat). He was healed by an application of essence of dittany by Hermione. She cast "protective enhancements" spells to surround them with security. They set up a camp-site with a tent for a temporary abode, and unsuccessfully and frustratingly tried various other spells to destroy the locket. Harry was the first to wear the locket to keep it safe, when he experienced a continuing vision of Voldemort (the Dark Lord was earlier seen intimidating Diagon Alley wand-seller Ollivander (John Hurt) for information about a legendary wand). This new vision was of Voldemort (You-Know-Who) breaking into bearded, foreign wandmaker Gregorovitch's (Rade Serbedzija) workshop, questioning and torturing him, and then killing him with the Avada Kedavra curse, to acquire a wand that had been stolen from him. 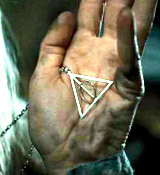 [Gregorovitch once had in his possession the most powerful Elder Wand, one of the three Deathly Hallows.] Hermione was the first to realize, while they all took turns wearing it, that the locket made them dark-tempered, mean and angry. 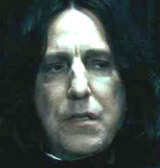 Their one contact with civilization, a radio, brought the announcement that Severus Snape was newly-appointed as Headmaster of Hogwarts, with strict house rules, bearing little resemblance to Dumbledore's school ("Snape's curriculum is severe, reflecting the wishes of the Dark Lord, and infractions are dealt with harshly by the two Death Eaters on staff"). A gang of bounty hunters formed by Lord Voldemort, called Snatchers, with the task of rounding up Muggle-borns (to turn in for rewards at the Ministry), passed by 'invisible' Hermione in the forest. 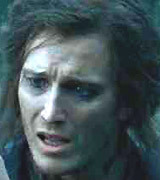 The leader Scabior (Nick Moran) smelled Hermione's perfume without seeing her. Ron needed to get stronger for the group to apparate elsewhere, to continue their search, so they aimlessly ventured on foot through the countryside, hiding out in a barn, and setting up their tent in new locations. As he wore the locket, Ron became exceedingly moody and jealous, perceiving Harry and Hermione as a loving couple. Suddenly, Hermione had an realization about the Sword of Gryffindor - it was goblin-made, and therefore dirt and rust had no effect on the blade ("It only takes in that which makes it stronger"). The blade of the sword had been impregnated with Basilisk venom, from the earlier second film. [In the Chamber of Secrets, Harry had stabbed the monstrous basilisk with Gryffindor's Sword. He then defeated Tom Riddle/Voldemort by plunging the basilisk's bloody poisonous fang into Riddle's diary, an earlier horcrux.] 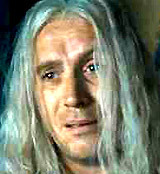 The venom was a substance that could destroy the locket horcrux, and "that's why Dumbledore left it to you in his will." Fully crazed by wearing the locket all day, Ron screamed madly at Harry: "I thought that after all this time, we would have actually achieved something. I thought you knew what you were doing...I thought you had a plan." After accusing Harry of not having feelings because he lacked a family, Ron ripped off the locket and stormed off by himself. The next day, Harry and Hermione apparated to a new location, making it difficult for Ron to locate them, as Hermione seemed forlorn. They danced together to a Muggle song ("O Children" by Nick Cave and the Bad Seeds) on the fading radio, appearing happy for once. While investigating the snitch and putting it to his lips, Harry noticed an inscription that emerged: "I Open at the Close." They also couldn't figure out the strange symbol found on the title page of her wizard children's storybook. At the wedding, the same symbol was worn on a necklace by Luna Lovegood's (Evanna Lynch) father Xenophilius Lovegood (Rhys Ifans) (editor of The Quibbler). The two decided to dangerously venture to snowy Godric's Hollow without using Polyjuice Potion, where Harry was born and grew up. It was also the birthplace of the founder of Gryffindor, and a possible location for the hidden Sword of Gryffindor. It was Christmas Eve when they arrived - they searched the local graveyard where Harry's parents James and Lily were buried after being murdered in their house by Voldemort. 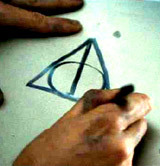 The weird symbol was located on the grave-marker of Ignotus Peverell. A figure resembling Bathilda Bagshot, who knew Dumbledore, summoned them to a house in the town, where it turned out to be a trap. Upstairs, Bagshot (speaking parseltongue) dissolved into the shape of Nagini, the hissing monstrous snake, and attacked and bit Harry. During the intense struggle, Harry was saved by Hermione with a Confringo command, and the two apparated to the Forest of Dean, where Hermione had once been with her parents. She suggested: "Maybe we should just stay here, Harry. Grow old." She identified the boy in a photograph seen in Bagshot's house (and in a copy of Rita Skeeter's book The Life and Lies of Albus Dumbledore), as Gellert Grindelwald, Dumbledore's brief friend. 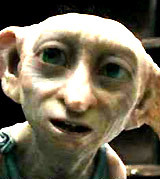 He was the one in Harry's vision who had stolen the Elder Wand from Gregorovitch's workshop. As they left Godric's Hollow, Hermione confessed that she had cast a curse which rebounded, and Harry's wand was destroyed. While keeping watch that night, Harry spotted a Patronus (a silver doe) and followed it to a small ice-covered pond, where he saw the Gryffindor Sword submerged in the water. While wearing the locket, Harry stripped down and entered the freezing water, but found himself strangling and drowning when the locket fought back, sensing the threat of its own impending destruction. Suddenly Ron returned and saved Harry, who then spoke Parseltongue to open the locket so that Ron could strike it with the Sword. But the locket retaliated - Ron began hallucinating, seeing a large dark monstrosity and spiders. He envisioned being unloved when told that Mrs. Weasley would have preferred Harry for a son, and a ghostly Hermione mocked boyfriend Ron, telling him she would rather have the 'Chosen One.' Then, he saw one of his deepest fears - a vision of Harry and Hermione kissing unclothed. Incensed, he struck the locket-horcrux with the Sword and destroyed it, and then quipped: "Just think, only three to go." Upon their return to Hermione in the tent, she was angry with Ron ("Don't think this changes anything"), although noticed the Sword in Ron's hand and the broken locket-horcrux. Ron explained how he had returned - he heard Hermione's voice emanating from the Deluminator, functioning as a homing device. When he clicked it, a tiny ball of light went into his chest and heart, and he disapparated to their hillside location. 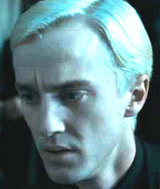 At Malfoy Manor, Lucius encouraged his son Draco (who had failed to please Voldemort in the previous film) to identify Potter (with the tell-tale lightning bolt scar on his forehead) and redeem himself by claiming credit for capturing him. 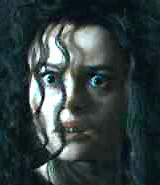 Malfoy's sister-in-law Bellatrix Lestrange became enraged when she noticed one of the Snatchers had the Sword of Gryffindor - she thought it was in her vault at Gringott's Bank. She took it back and cast out the Snatchers. 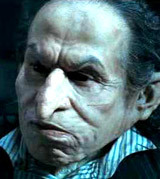 Harry and Ron were imprisoned in the cellar by Wormtail (Timothy Spall), where they found others: Luna, wandmaker Ollivander, and Griphook the Goblin (Warwick Davis). Bellatrix tortured screaming Hermione by inscribing the word 'Mudblood' in her left forearm, to find out how she had obtained 'her' sword. With a magical two-way mirror chard (given to him by Sirius Black), Harry summoned help from Aberforth Dumbledore (Ciaran Hinds), Albus' younger brother - and Dobby appeared. After disapparating with Luna and Ollivander to Shell Cottage's beach, Dobby returned to save Harry Potter and his friends. As the group were rescued during a wand-duel and struggle, they were all able to disapparate but Bellatrix's thrown dagger hit Dobby. 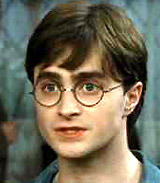 The elf with a lethal wound in his chest died in Harry's arms on the beach: "Such a beautiful place to be with friends. Dobby is happy to be with his friend Harry Potter." Dobby was given a proper burial without magic near Shell Cottage (where newly-weds Bill and Fleur lived). In the final scene, Voldemort visited Albus Dumbledore's White Tomb (located near Hogwarts), opened the coffin, and stole the Elder Wand. This was the seventh film in the long-running series-franchise. 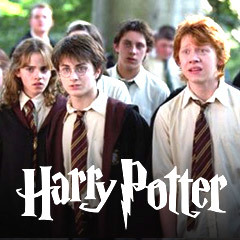 It was based upon J.K. Rowling's seventh and final Harry Potter book, which would be split into two films. With gross revenue of $295 million (domestic) and $954.5 million (worldwide), making it the third highest grossing film of the series, at the time. With two Academy Award nominations (and no wins): Best Art Direction, and Best Visual Effects. Key Scene: After Ron left his friends and stormed off, Harry danced with a forlorn Hermione to cheer her up - to the tune of Muggle radio music. David Yates had also directed the previous film, Harry Potter and the Half-Blood Prince (2009), and would direct both parts of this episode. Part 2 would be the only Harry Potter film to be released entirely in 3-D.